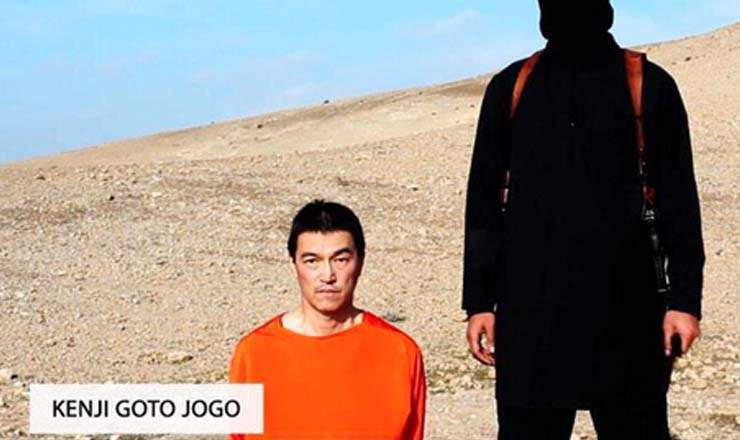 Japanese hostage Kenji Goto has been killed by Islamic State militants, according to a video released online. The video comes less than a week after news of the beheading of another Japanese man, Haruna Yukawa. Kenji Goto Jogo, 47, is a well-known freelance journalist and film-maker who went to Syria in October, reportedly to try to secure Haruna Yukawa’s release. Japan said it was trying to authenticate the video. The video, which bears the same symbols as previous ISIS videos, shows a militant with a British accent killing Kenji Goto. Japanese government spokesman Yoshihide Suga said Japan was “outraged” by the video, adding that the cabinet was meeting to decide a response to it. US National Security Council spokeswoman Bernadette Meehan said: “We have seen the video purporting to show that Japanese citizen Kenji Goto has been murdered by the terrorist group ISIL [ISIS]. Japanese officials had been working with Jordan to secure the release of Kenji Goto and a Jordanian pilot, Moaz al-Kasasbeh, who was shot down over Syria in December. However, earlier on Saturday they said negotiations had become deadlocked. An ISIS video released on January 27 said Kenji Goto had “only 24 hours left to live” and Moaz al-Kasasbeh “even less”. They later gave a deadline of sunset on January 29 for a deal by which Kenji Goto would be freed in return for Jordan releasing captured Iraqi militant Sajida al-Rishawi. But the deal may have been complicated by Jordan’s demand that Moaz al-Kasasbeh also be released. It has also emerged that the militants had exchanged emails with Kenji Goto’s mother, who has pleaded publicly for her son’s release. ISIS had initially demanded a $200 million ransom for the two Japanese hostages.